One thing I really love about the new iOS devices - iPhone 5S, 6, 6+ and the iPad Air 2 - is the Touch ID sensor. I’ve always had a PIN on my devices - there is too much important information on my phone to not have one - and TouchI ID takes the pain out of it. It's also core to the iOS experience: Apple Pay relies on it, and it's used by iTunes and a lot of other Apple apps. But one thing I want is a nice, easy way to use the Touch ID sensor in my own apps. iOS8 introduced the Local Authentication APIs. 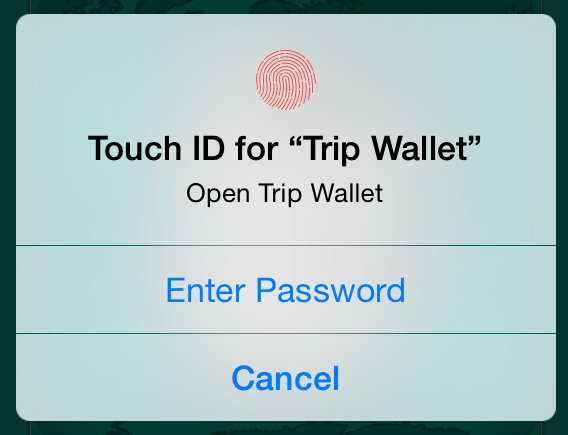 This makes it easy - trivial - to request a Touch ID authentication. This is all good and easy, but it gives the user an option I don't like: they can use Touch ID, or they can enter a password (or cancel). And if there is no Touch ID, it'll just not work - it's finger prints or nothing. Worse, there is no way to turn off the password option (or change the text). One thing I didn't know about until recently is that you can get the same - or similar - prompt, but allow it to fall back to the devices PIN, without a password option. This means it works on any iOS8 device. For most of my uses - validate that the person on the phone is the owner or someone the owner has trusted - this is the best option. It's just not that obvious how to do it. In Objective-C land, this is kSecAttrAccessibleWhenPasscodeSetThisDeviceOnly and kSecAccessControlUserPresence. For the life of me, I can't find reference to it in Apple's docs, but they do have a sample and also slides from a WWDC session on this. Maybe we get the docs in iOS9. 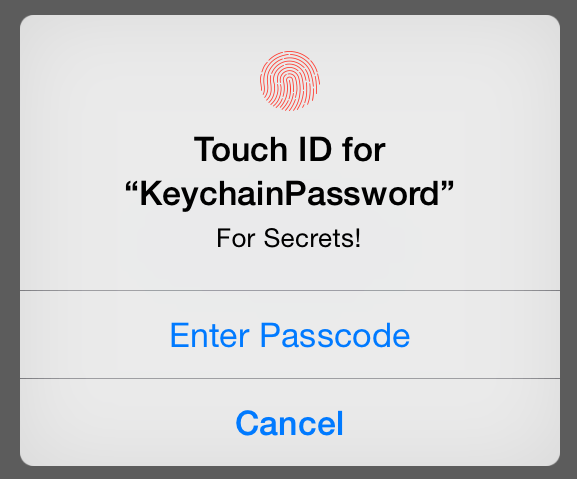 And better yet, on iOS8 devices without Touch ID, the user is prompted for the PIN if they press "Enter Passcode". There is still no customisation of the dialog. No option to ONLY use Touch ID (no PIN), which would be nice. And no fallback for devices which have no PIN set at all - you'd need to make your own PIN screen for that. I've put together a very basic project which shows how it works. It's iOS8 only, tho it works on iOS7 - it just will not let you in! When I get around to rewriting Trip Wallet, I think I'll use this as the main authentication method.